Hundreds of people who were tortured before seeking asylum in the UK could seek compensation and release from immigration detention. The High Court said the Home Office had failed to follow its own policy on releasing detainees who could show they were victims of torture. In a test case, five detainees successfully argued that officials had ignored medical evidence. Official policy is only to hold torture victims in exceptional circumstances. But each of the test case claimants argued that policy had been, to all intents and purposes, brushed to one side. A Home Office spokesman said the findings would be considered "very carefully". The defeat for the Home Office comes after repeated attacks from charities and MPs on its policy dictating how and when to detain people who have been tortured. Under the current rules, if someone who is in immigration detention says they have been tortured they should be examined so that a provisional report can be sent to UK Border Agency (UKBA) officials - a process known as a Rule 35 report. The report should in theory trigger a more thorough review of the case so that officials can decide whether to order the individual's release. But in each of the test cases, the detainees said they had been unlawfully detained because of a systematic failure by the UKBA to take the process seriously. Jamie Beagent of law firm Leigh Day, which represented the five, said that the Rule 35 process led nowhere. "In most cases a detainee's allegation of torture was recorded without any actual medical assessment or concerns raised," said Mr Beagent. "In turn, Home Office caseworkers simply accepted these reports without seeking more information and dismissed allegations on the basis that the caseworker did not believe the detainee. "The consequence is that the protections supposed to be afforded by the Rule 35 process simply do not work." The detainees won their cases because each of them had received a second independent examination and report with the help of Medical Justice, an expert charity. The court didn't rule that it is unlawful to detain people who have been tortured - but the judgement said that the system was not working as it should. That ruling paves the way for immigration detainees who have had a Rule 35 report ignored in the past to seek to be released - and potentially seek damages for unlawful detention. 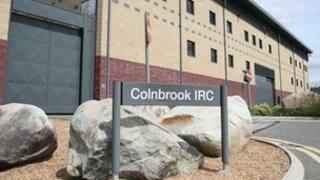 A spokesman for the Home Office said: "This is a complex judgement and we will consider the findings very carefully. Although we are disappointed with aspects of the ruling, we note that the High Court has endorsed our wider policy regarding the detainment of former torture victims. "Britain has a proud tradition of providing protection to those who need it. Those that have survived torture are normally only considered suitable for detention in very exceptional circumstances, but there may be times when it is necessary to detain individuals before they are removed from the UK." The Home Affairs Committee said in a recent report that it was concerned by the "enormous gap" between the number of reports from people in immigration detention of torture and the small number of eventual releases. Some 231 Rule 35 reports were sent to officials in the third quarter of 2012 - approximately 6% of them led to an individual being released. The MPs called for an independent review of Rule 35's application, saying it wasn't plausible that the UKBA was taking it seriously. Keith Best of Freedom from Torture, a charity that helps victims, said: "Today's judgement confirms the argument we have made for years about the systemic failings in the operation of Rule 35. "Freedom from Torture is calling for the home secretary to re-engage with medical charities to fix these problems and ensure compliance with the safeguards imposed by Parliament against detention of torture survivors in the UK's immigration detention centres."